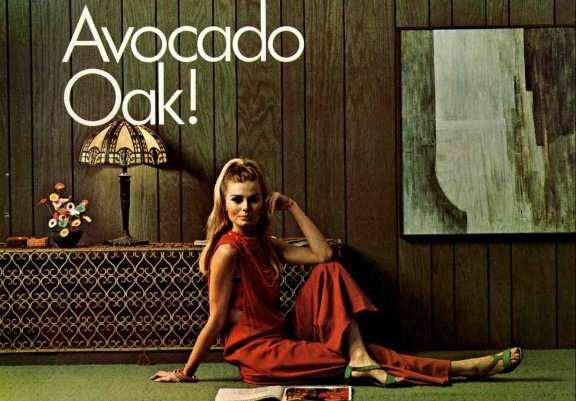 A look at 1968 – yes, the era of avocado green, harvest gold and other very distinctive designs. 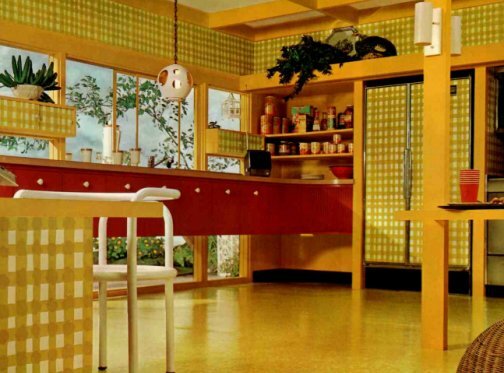 I have to say, I really am growing to adore 60s and 70s kitchens, bathrooms and interiors. These people were having a lot of creative fun. 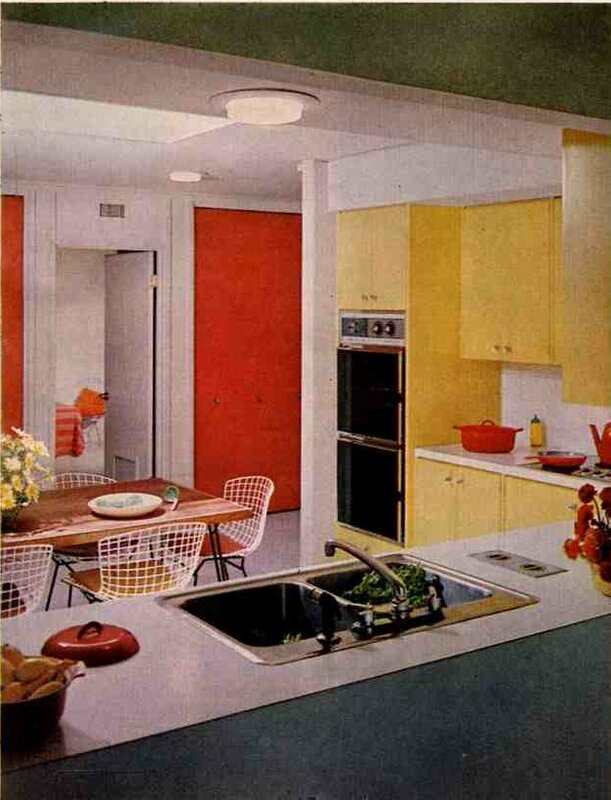 Imagine owning a 1971 split level and outfitting it with a red and black rumpus room… bedrooms with multicolored shag carpet…a Nutone intercom throughout, a Drexel Mediterranean dining room set. Hey! That was my house in 1971! A triumph. Cut to the chase: 70s decor is back – big time. 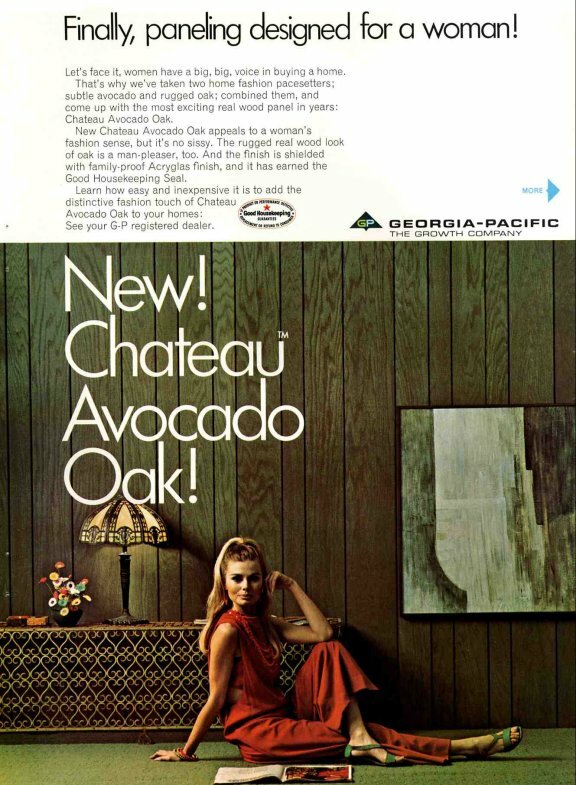 Avocado Oak ad: Georgia Pacific. 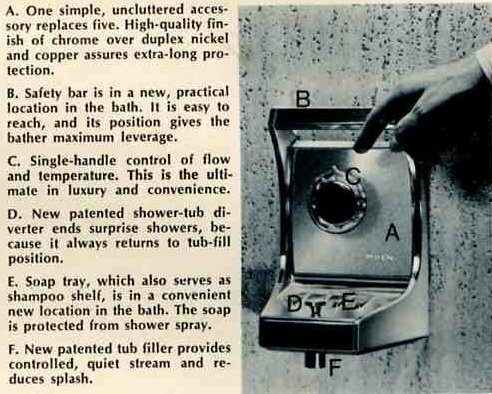 Isn’t this Moenique bathtub/shower faucet terrific? Those are “persian” tiles behind – very popular in ’68, as far as I can see. 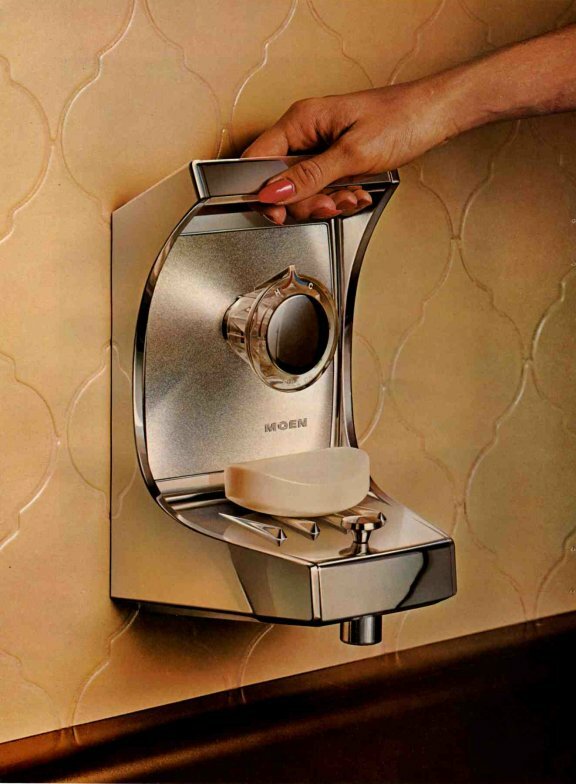 Ad: Moen. 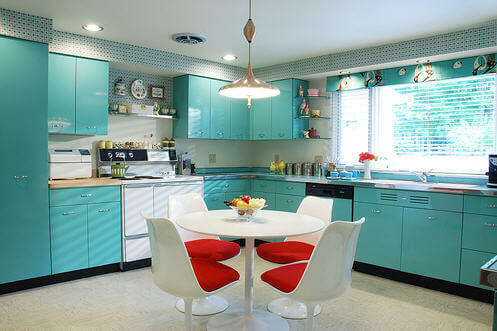 In the kitchen, it’s Andy Warhol pop colors all the way. That’s wallpaper on the fridge. This kitchen is so well done. Ad: Armstrong. Those panels lining the tub and shower are Formica laminate. I don’t think the stuff turned out to be very waterproof. Pretty, though. And I really like the mirror and framed print arrangement above the sinks. Tip: Look for unusually-shaped mirrors like this – they can work in so many possible spaces. 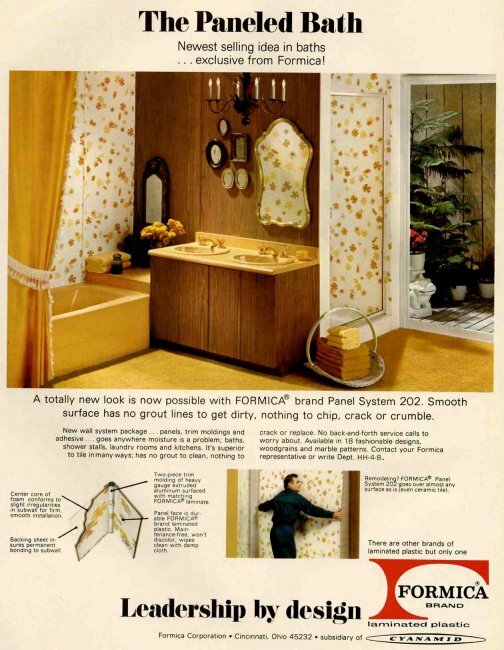 Ad: Formica. 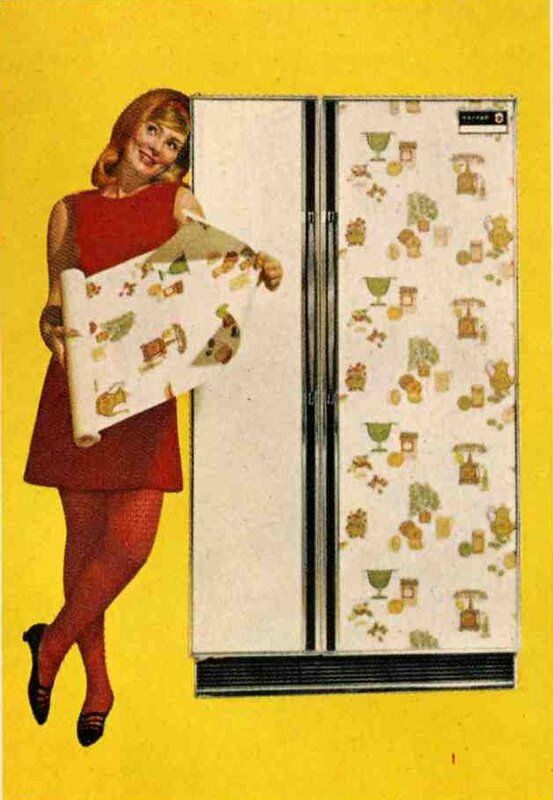 I really have a hard time believing that many women put wallpaper on the front of their appliances. But, it certainly is an idea…. Ad: Frigidaire. I adore this style of wallpaper. 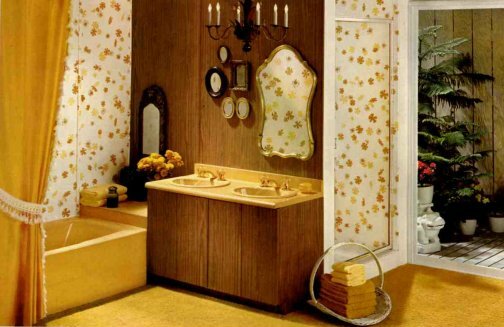 The gold, green, orange colonial motif – just makes me so happy. And this is a wonderful Frigidaire. I am quite partial to side-by-side refrigerators. They are particularly good when space is tight. Note, they are not as energy efficient as fridge-on-top styles, I believe. 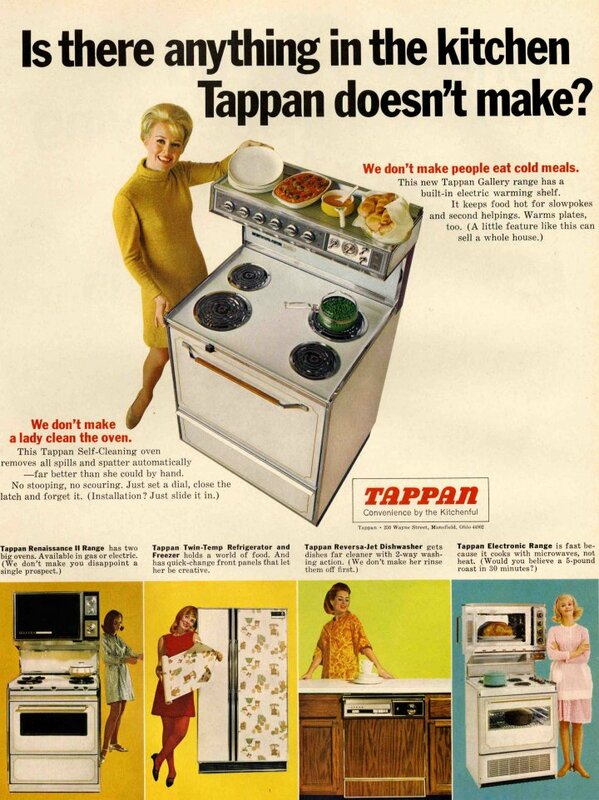 Ad: Tappan. Should this avocado bathroom be saved? Back in the 70’s when we were renting we bought a used 18 cu. 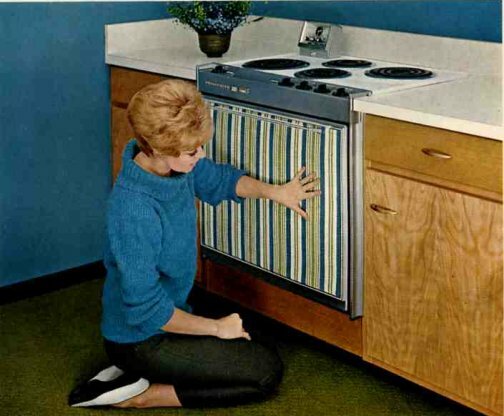 Frigidaire. It was sort of scuffed on the outside and was white. I had an avacado sink(still do) and an avacado stove. I could not afford a new fridge. I put a pink and green small floral pattern contact paper on the fridge and thought I would probably hate it later but I loved it,, it was uniquely mine. and it was the best fridge we ever owned. We must have moved 3 times with it before it finally quit on us. I just bought some vintage curtains that I want to design my bedroom around. They are this deep orange and brown- thanks for the ideas! I’m an electrician and have seen hundreds of renovations and interiors. My big take-away with regard to retro style is how much better it looked when it was new. Any material which cannot hold up to regular use and cleaning is a bad idea. Veneered cabinets and stained paneling don’t hold up to scrubbing. Laminate shower walls will delaminate and grow mold. I wouldn’t mind a blood orange countertop or starry tub surround, but I would choose a different material such as Corian or quartz. Tile backing has come along way, too. Using purple drywall and Ditra will help a tile installation last longer. 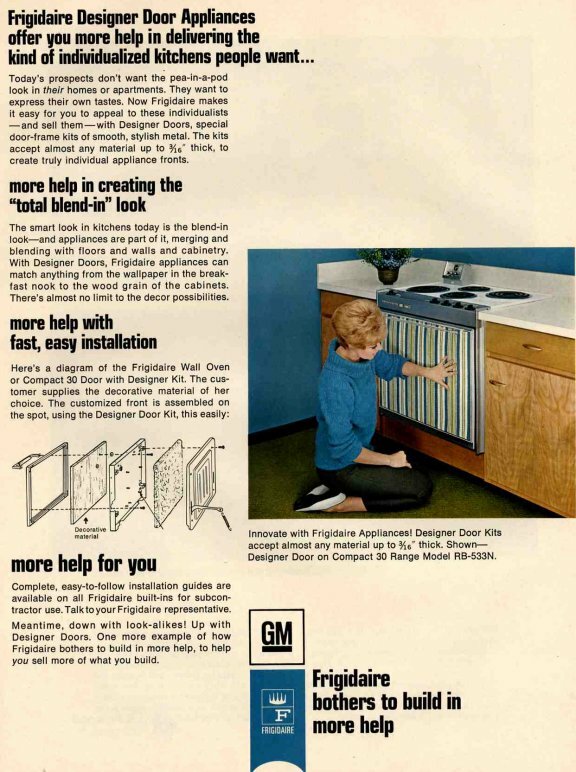 that we put up covering two walls that previous owners had put up ugly, fake wood paneling…it looked terrific then and it still looks good…oh- how I long for the “good ole days” when I read articles like these.